The following exercises are a sample from the six pages of Two-String Studies in the book. Picking across the strings (one note per string) is more difficult than playing several notes on each string. 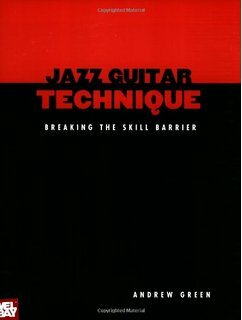 The exercises in this section address this aspect of guitar technique. Start with the two-string interval studies. These may seem easy at first, but playing them at fast tempos will make the technical challenge apparent. Follow the string and finger indications to get the intended benefit. The following exercises are a sample from the six pages of Three-String Studies in the book. The three-string studies feature triad fragments and other structures commonly heard in modern jazz. Like the two-string studies, the last example introduces two notes on the middle string.